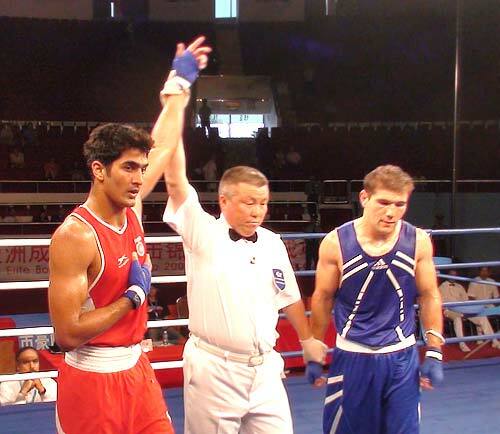 Thokchom Nanao Singh assured himself of a medal by advancing to semi-finals while Olympic bronze medal winner Vijender Singh (in the picture) pulled off a stunning triumph over Uzbek Atoev Abbos to enter the quarter-finals of the Asian Boxing Championships in Zhuhai, China, on Tuesday. Vijender stunned Abbos, a 2007 light-heavy weight (81kg) world champion before shifting to middleweight (75kg) this year, 10-7 in an exciting contest. The two were tied 3-3 at the end of the first round but taking advantage of his height and reach, Vijender broke his opponent's defences in the next two rounds to win comfortably. "It is a huge win for me. He was a World champion and was the favourite before the bout. But I was least bothered and took the ring with confidence," an elated Vijender said. Youth World champion Nanao Singh (48kg) rallied to beat Chia-Lun Lu of Chinese Taipei 8-4 and reach the semi-finals. He trailed by a couple of points in the opening three minutes before getting his act together in the next two rounds. 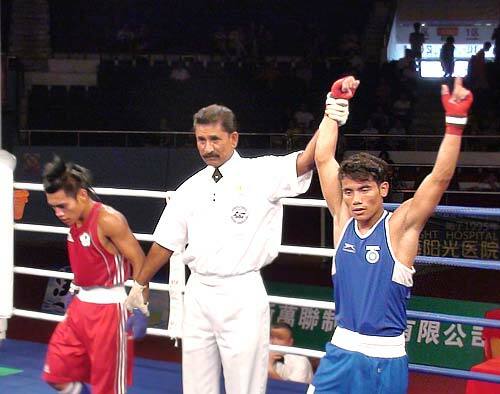 "We were slightly scared after the first two rounds but Nanao boxed really well to pull it off," national coach Gurbax Singh Sandhu said. Nanao will face Mongolia's Nyambayar Tughtsogt in the semi-finals.